Brakes went to toe to toe with the National League North’s in-form team, and though few could argue that Stockport deserved the three points they were pushed all the way by Paul Holleran’s side, writes Paul Edwards. The only goal came courtesy of a fortunate deflection in the 37th minute that left Darren Stephenson with a simple close-range header to delight the sizeable travelling support who already seem convinced that they are on the way to promotion. Chorley would no doubt have something to say about that but Stockport clearly have momentum at present and this could well be their year. The visitors opened brightly, Tony Breeden punching an early corner away from his goal before Junior English instigated the first piece of Leamington pressure when cutting in from the right and beating his marker, but only finding the arms of keeper Ben Hinchcliffe. The visitors engineered several half-chances before extending Breeden just past the half-hour, Matty Warburton driving powerfully towards goal only for the Brakes number one to dive full length and push the ball behind. Leamington used the wings well in the first half and Ahmed Obeng beat Sam Minihan on the left but picked the wrong pass and Stockport were comfortably able to clear the danger. Colby Bishop gets up for a high ball. The visitors edged in front with the only goal of the evening eight minutes before half-time. Warburton picked up a cross from the right and fired in a shot that clipped the heels of Joe Clarke and looped towards goal. Stephenson timed his dart away from the line of Brakes defenders just right and had the simple task of nodding the ball in from close range, Breeden looking on helplessly. It was a disappointing way to concede but Leamington pushed forward in search of a leveller and, after forcing two corners just before half-time, Colby Bishop headed towards the far post where Jamie Hood, perhaps not expecting the ball to reach him, stabbed a good opportunity weakly wide. Breeden rose well to punch Stockport’s first corner of the second half well clear of his goal but the visitors continued to create chances. Hatters skipper Ash Palmer headed wide from another corner after Frank Mulhern’s shot was deflected wide and Mulhern then back-heeled wide from Stephenson’s cross before setting up Adam Thomas, who dragged his shot just past the far post. Jordan Keane’s well-struck volley from a half cleared corner was well held by Breeden, who was called into action once more when Minihan’s cross from the right deflected and looped down towards goal. The danger had not passed, however, and Sam Walker drove in another effort that was parried by the skipper. 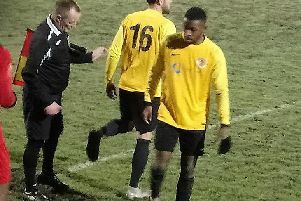 West Bromwich Albion youngster Sam Wilding was introduced for his debut just past the hour-mark, and the loan man, along with Obeng, saw a shot blocked as Leamington attempted to make an impression on the Stockport goal. 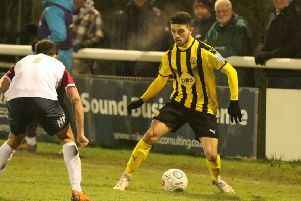 Brakes began to enjoy more of the ball as the game entered its closing stages but despite some bright approach play the visitors were in no mood to surrender their advantage. Connor Taylor exchanged passes with English and drove into the box but could only find Hinchcliffe with his cross. Jamie Stott was then well placed to deflect a stinging effort from the substitute away from goal for a corner, from which Bishop headed over the bar and Stockport were left to celebrate another win which takes them to within four points of the National League North summit. Holleran was not too downbeat, however, at the final whistle, praising the fighting spirit of his patched-up side. “We were hoping to have Connor Gudger back tonight, we did a bit of work in training with him on Thursday and then again at Boston on Saturday and we spoke to him on Monday but really it’s not quite right. “We’ve got to be careful because it’s an injury that if we rush him back, it could keep him out for even longer. “Jack Lane did really well in that position tonight, it’s a role we know he can do, so that was good. “Kieran Dunbar has had a scan and we’re waiting for the results of that. “We think that there could be a fracture in there, so that’s one that could go on for a bit as well. “So yeah, we’re a little bit stretched but I thought that the players who were out there really battled, fought, scrapped, showed some good quality at times, but just in that final third, that little bit of composure and quality that you need, we didn’t have it. “And you need it against these sorts of teams because the intensity of the way they play, the way they defend and close you down. “You can see why they have gone on the run they are on, you really can, but we gave them something to think about tonight. Brakes: Tony Breeden, Junior English, Jack Lane, Joe Clarke (Sam Wilding, 64), James Mace, Jamie Hood, Jordan Murphy, Reece Flanagan (Connor Taylor, 69), Colby Bishop, Jack Edwards, Ahmed Obeng. Subs not used: James Bowen, Callum Gittings, Ben Newey. Stockport County: Ben Hinchcliffe, Sam Minihan, Scott Duxbury, Jordan Keane, Ash Palmer, Jamie Stott, Adam Thomas (Elliot Osbourne, 82), Sam Walker, Frank Mulhern, Matty Warburton (Dan Cowan, 78), Darren Stephenson (Jake Kirby, 85). Subs not used: Ian Ormson, Nyal Bell.